I hide books from my son. No, I’m not some horrible mother who refuses to read to her child. Trust me, I read books to him all day long. Handsome Boy has a big basket of board books, which sits in the living room right next to a big basket of toys. 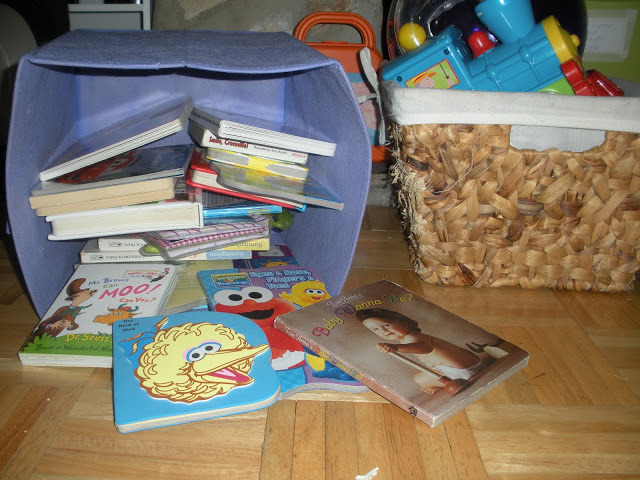 There are 20-30 books in the basket (or on the floor surrounding the basket) at any given time. He is free to bring me any of these books and I will gladly read it to him. Except, lately, I rarely get to actually read the books to him. See, Handsome Boy is 13 months old and is rapidly acquiring language. He wants to know the name of EVERYTHING he sees. So he points, and I name. He will point to the same thing 5 times in a row, and I will name it 5 times in a row. Then he’ll point to something else and I name it. Then he’ll point to the first thing again, just to make sure it’s still the same as what I told him 3 seconds ago. It sounds tedious, but I actually love this game, well, most of the time anyway. What I love most is the look on Handsome Boy’s face, so serious, so studious. This is important stuff, and he knows it. I see patterns in the things he points to. On practically every page of practically every book I can tell you what he’s going to point to first, and second. It’s rarely more than 2 things per page. He’ll point at those same 2 things, in order, every single time, for days, weeks even. Then, he’ll pick one or two new things, only occasionally going back to the original objects, y’know, to make sure I didn’t change my mind on what they’re called. Now, to the reason I hide books. I didn’t forget about the purpose of this story. Shocking, I know. Sometimes, Handsome Boy gets mad at his books. Not just mad, furious. I don’t really know why, and I never see it coming until it just happens, out of the blue. He’ll be happily pointing away, filing names of various objects away in his internal dictionary. Then it happens. He starts pointing harder, then harder, like he’s trying to push his finger right through the cardboard page. He grunts while he does this. Then his voice gets whiny and he starts slapping the book. He frantically turns the pages, getting angrier and angrier as he flips forward and back. He begins to yell at the book. He is furious. This book has somehow wronged him. I am at a complete loss as to why. What atrocity has this book, which he loved only moments ago, committed against him? By this point, he has drawn the book over his head and is getting ready to fling it across the room. I pluck it from his hands, and banish it to the hidden book pile, where it must remain for at least a week. By then, whatever indiscretion has been forgiven and forgotten, and it can once again resume it’s place in the rotation.